Our elegant new Designer Suites offer luxurious surroundings, seafront balconies and superb views. Each spacious suite is finished with sumptuous materials and accented with unexpected special touches, guaranteeing a stay to remember. Our 39 square metre Juliani Suites offer guests more space to relax and unwind. Each Suite also has a balcony overlooking the picturesque Spinola Bay, perfect for watching the world go by over an evening drink. Our 35 square metre Junior Suites offer guests more space to relax and unwind. 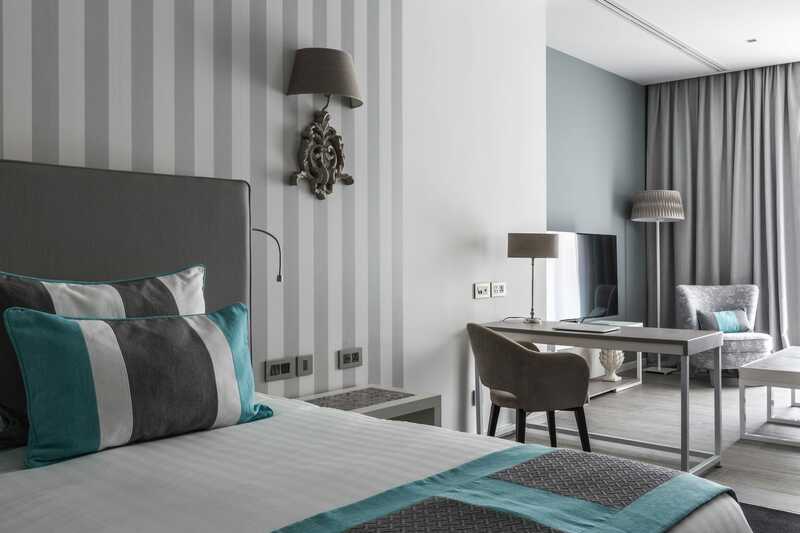 Each Junior Suite also has a balcony overlooking the picturesque Spinola Bay, perfect for watching the world go by over an evening drink. Our Sea View Deluxe rooms are comfortable and elegant. Equipped with everything you need for a pleasant stay, these rooms are highlighted by beautiful views. Our Standard Rooms are well equipped with everything you need. Elegantly decorated and comfortable, they are a calm oasis at the end of your day of work or play. An ECO Contribution tax of .50c EUR per day, per guest over 18 years of age will be applied on all stays. The ECO tax is not included in the rate and will be added to the total bill at checkout. The cap is a maximum of 5 EUR per person, per stay. Please contact the Hotel for further information. Book any room type for 4 nights or more and receive a complimentary airport pickup (save €22). This offer is valid for reservations made directly through our hotel website.